If you want an affordable single malt finish (that is, ending its maturation process in a cask of a different origin from its primary maturation cask), Glenmorangie is going to be your best bet in terms of value. They have produced a wide array of finishes as part of their regular expression lineup. Take, for example, Glenmorangie Quinta Ruban, which is is Glenmorangie’s port finish. I love it. It’ll set you back around $60 here in Maryland, one of the most affordable port finishes you’ll find. I’ve done searches online for affordable port finishes and the ones that come up are Tomintoul 12yo Port and Arran Port Finish 50%, neither of which are available here. Everything else is far more expensive (Check out the price of Balvenie’s Port Wood! — granted it’s aged far longer and I personally believe it’s worth every penny… but still!). 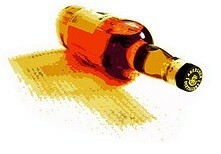 But for today, we’re talking Glenmorangie – The Nectar D’Or. Aged 12 years, it’s their Sauternes finish. Sauternes is a sweet French wine from the Sauternais region (of the Graves section) of Bordeaux. Sauternes itself is a fun dessert wine because it’s made from Sémillon, Sauvignon blanc, and Muscadelle grapes. Now get this… the Muscadelle grapes have to have been affected by Botrytis cinerea, or noble rot, because it causes the grapes to be partially raisined! Sauternais has the perfect environment for this noble rot. I found that fascinating. I recommend, given the opportunity, that you try the finishing product (in this case Sauternes) whenever possible. I am a big fan of port so I was able to figure out its impact on the Quinta Ruban. I’ve never had Sauternes so I can’t as easily pick out its impact on Nectar D’Or but some things are hard to miss. Nose: Citrus, light raisins and fresh grapes, and a light sweetness with a richness of hazelnuts. Palate: Honeyed from the get go, citrus, with toasted almonds and hazelnuts. There’s a bit of the cereal and barley flavor in there but it’s very much a dessert finish. Doing some brief research, there aren’t a tremendous amount of Sauternes finishes out there. A quick search on Royal Mile Whiskies revealed only seven, many of which showed low stock and probably aren’t available here in the States. If you’re sold on Sauternes or just want to give it a try, this is your best bet if your here on this side of the Atlantic. As for this dram, I enjoyed it. It’s fun tasting a wine through a whisky because you can tell that this marriage was probably a big challenge. Port has has big bold flavors, it’s fortified with brandy, so that marriage is of equals. Sauternes is like more delicate and so the flavors it imparts are lighter, citrusier (is that a word? ), and so you won’t get the big influence you see in Quinta Ruban. I’d give it a go if I was expanding my selection, certainly a good dram, but I prefer the port finish (and even the sherry finish in Lasanta). I’m a sucker for a good finish and lately I’ve been poking around all the port finishes of my favorite whiskies. My last tasting note was for the 2013 Laphroaig Cairdeas, which I really enjoyed, and today I’ll be looking at a more common dram – Glenmorangie Quinta Ruban. Curious how they chose that name? Me too. I emailed Glenmorangie and Barbara Hirst, in the Visitor Centre, responded! Quinta is what they call an estate in Portugal where the grape for the Port is grown. (Just like we would call a farm in Scotland a Croft) Ruban is a Gaelic word for ruby which is the ruby red colour of the whisky as it takes on the colour of the port wine that has been in the cask before we have used it. 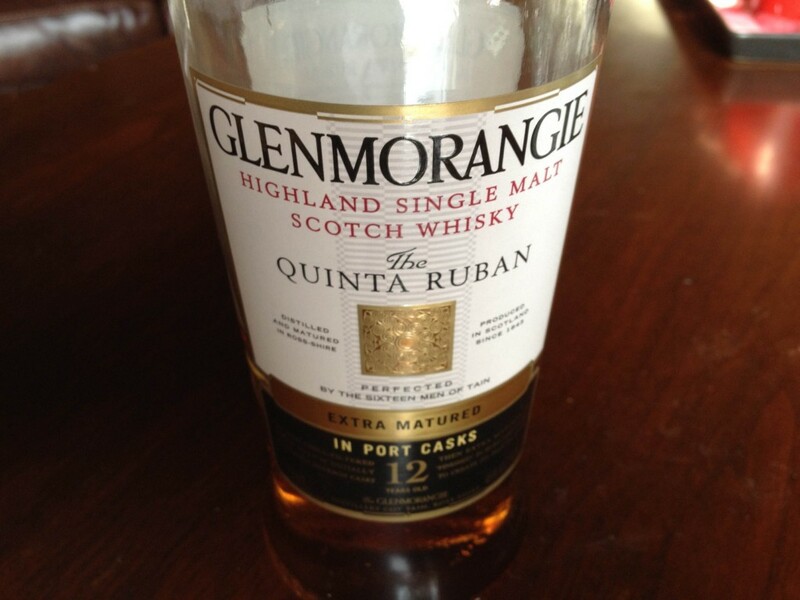 I chose Quinta Ruban as my next note for a couple reasons. First, Glenmorangie is readily available in the United States and Quinta Ruban is a finish that I’d seen numerous times in the store. Next, they scored a Gold in the 2013 IWSC, which is just a notch under Gold Outstanding (top award). Ealanta and Nectar d’Or, two other finishes, also scored Gold in 2013. How did it stack up? Tasty. Personally, I enjoy port quite a lot. There is, however, a reason why it’s typically served in tiny glasses. It’s very sweet, very warm and inviting, but it’s almost too sweet. Too much of it is just that – too much. It’s like ice wine, delicious as a change of pace, as a closer, but you don’t want to drink many glasses of it. In terms of price, it costs $60 for 750ml here in Maryland, which isn’t expensive for a finish (especially port, go check out the cost of other port finishes and you’ll be stunned) but pricier than your average bottle of that age. By comparison, Glenmorangie The Original (a 10YO) is $38. To summarize, it’s a good marriage of a fine scotch with one of my favorite finishes, without the heavy price tag. Whenever whisky is aged in barrels, the barrels are rarely virgin casks. They’ve typically had something else in them for a period of time. Macallan has a partnership with Jim Beam and Macallan is aged in what were formerly bourbon casks (it’s pretty standard for scotch to be matured in ex-bourbon casks). Then, you have the various finishes, which typically finish in dessert wine casks like sherry and port. If you’re familiar with Glenmorangie, you know they have an entire line of finishes from Oloroso to Port to Sauterne (Extra Matured line). Each are dessert wines from various regions and impart different characteristics to the whisky. 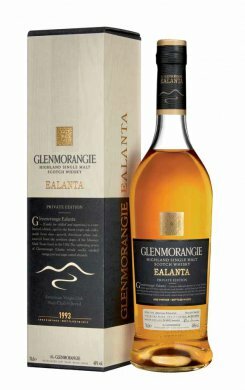 So I was surprised to read about their latest release, Glenmorangie Ealanta, included in the Private Edition, which includes Artein, Sonnalta PX, and Finealta. Glenmorangie Ealanta is a 19-year old with 46% alcohol by volume and aged in virgin American white oak. The casks have been heavily toasted but they never held anything else. It’ll be interesting to see what the critics say.